BBC Radio 4, "In Our Time," was about enzymes this morning. It was full of wonderful insights, even, or perhaps especially, for a non-scientist like me. I add this diagram (nicked off the internet ) in a spirit of confused humility! Brilliant chemists, like this morning's panel, often need to find analogies to move their understanding closer to ordinary more or less colloquial speech. The panel's chair, Melvyn Bragg, asked "what would happen if there were no enzymes?" The answer was crisp and clear: there would be no life. At all. At one point, they were discussing the mind- boggling speed and effectiveness of enzyme reactions within cells. 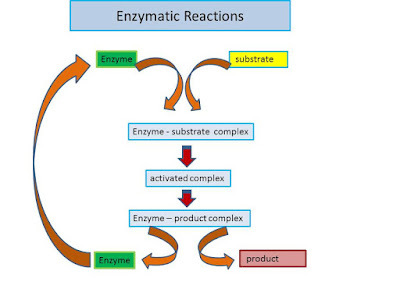 The way enzymes single out chemical situations and speed them up, or allow them to happen at all, sounded truly awe-inspiring. Using the only sort of analogies that are available to most of us, Bragg said they sound almost intelligent. The panel got a bit uneasy with the idea of intelligence at the level of chemical reactions, and framed it all entirely within the random processes of evolution. I suspect the panel could feel at their backs the spectre of "intelligent design," of evolution as designed by God the Father, of the dogmatic ignorance and intolerance of some fundamentalist Christians. But my little brain was whirling. Here was a contact point for those who who don't accept the anthropomorphic God of the Christian Bible, but who want to feel the presence in our lives of something more profound and more, er, sacred? than our ordinary human perceptions and context for actions. Chemists can do extraordinary things with genetic engineering into the activities of cells and the enzymes, right down to the level of genes and DNA. So it is not, I hope, to obfuscate the rational power of their thinking with some wishful, vaguely consoling mystical mist, to say that the sense of wonder I felt at this point in their discussions was pretty close to what people often rather lamely call religious. I guess I'm trying to say that a scientific view of the chemical reactions without which there would be no life is so complex, it reveals so intricate and powerful a life force, and it is so completely part of the rest of the universe that we call not-life; such a view can make me feel the presence of what I have to call sacred because I don't know another word for it. I don't know another word because when we're in touch with this presence we enter states of being and realms of paradox that may not be expressible in ordinary linear, rational speech. I'll finish off this ramble with a very neat little observation from one of the chemists. He said that bacteria are much more adaptable, smarter chemists in one sense, then we are. They can adapt molecules to create new molecular combinations that they need. We can't do much of this. For example, we can't create vitamin C, but if we don't put any into our systems then we get scurvy, horrible things happen to us and we are likely to die. So we eat stuff with vitamin C in it and that passes into our systems so our teeth don't start falling out. A vitamin is just a term for an essential substance that we can't synthesise within ourselves. OK, there's nothing intelligent or divine in the ordinary sense about what bacteria do when they use enzyme reactions to adapt to their environment. They do what they do, they can't help doing it, they have no choice about it! So: enzymes can make thousands of reactions occur per second that would otherwise take beyond the lifetime of the universe. And all life depends on these enzyme functions. That sounds pretty close to what people used to call omnipotent, Godly. This is within their own context of course, and literally countless other things have to happen, and have happened, for enzymes themselves to exist. If they are Godly, they have no morality or allegience or other human attribute. So at least you can't claim they're on your side. The drone pilot and the suicide bomber, Mrs May and Mr Corbyn, the Pope and Ian Brady are all (or were) entirely enzyme-dependent! A human being has been described (by one of them) as "just a puddle of chemicals." Just??? I am just reading Primo Levi's Periodic Table. He uses these chemical elements to be the metaphor of his own story and one's he makes up. Brilliant! Lovely book, thanks for reminding me, must get back to it sometime.